I think of how many times I have stood at a grave site and taken pictures in my role as a genealogist. I imagine it was hundreds of time. 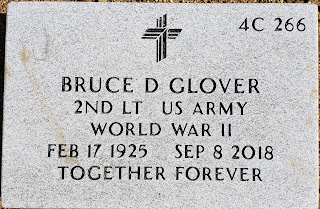 I wasn't prepared for the overwhelming emotions when I stood at my father's grave site and photographed his headstone. I found that the hardest part of my genealogy journey so far. 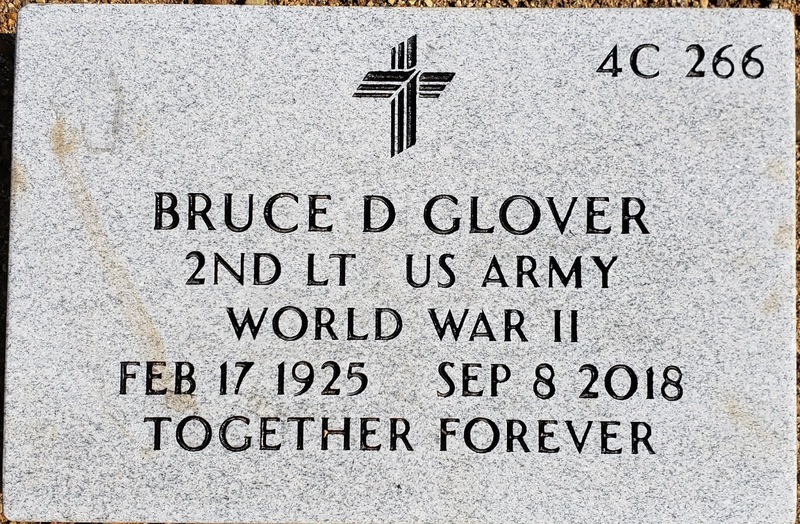 My father, Bruce David Glover, died Saturday, September 8, 2018. He had been in hospice care since April, 2018 for congestive heart failure. He was 93 years old. I was there at the hospital when the doctor and chaplain told us he could no longer be cured and I was there the day he died. Those two days were hard, but I am a caregiver and went into caregiver mode and decided to be there for my mom and dad to give them the dignity, respect, and care they deserved and earned at this time in their life. I don't think I grieved until almost three months after his death. I was watching George H.W. Bush's funeral and the flood gates opened. The eulogy talked about someone rubbing Presidents Bush's feet the day he died and it was something I had done many times for my dad. The memories came rushing back at that moment. My mindset after his death was that I didn't have time to grieve, I had things to do! Plus, I wanted to make it easier on my 88 year old mother by helping with everything one has to do after a death in the family. I will be sharing more of my father in blog posts to come. He lived from 1925-2018 and he filled that dash fully. It will be with joy that I share his life with you. That won't be hard at all.